This realistic looking roll of toilet paper is IMPOSSIBLE TO TEAR!Impossible "Paper Work" For Any "Sit-Down Job". Perfect payback for the prankster in your life, this is the dirty little gag you've been waiting for. 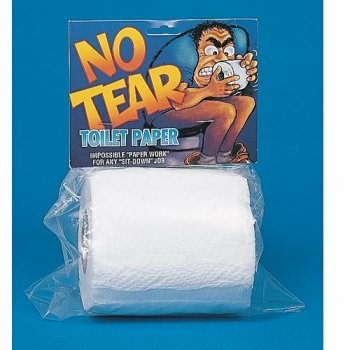 No Tear Toilet Paper is so frustrating you'll definitely settle the score. Great way to get revenge on those who refuse to replace empty toilet paper rolls.To use: just replace a real roll with this no tear roll and wait for the laughs to begin!